April 11, 2019 | General Membership Meeting | Location: Door County Fire Co. 38 S 3rd Ave, Sturgeon Bay. 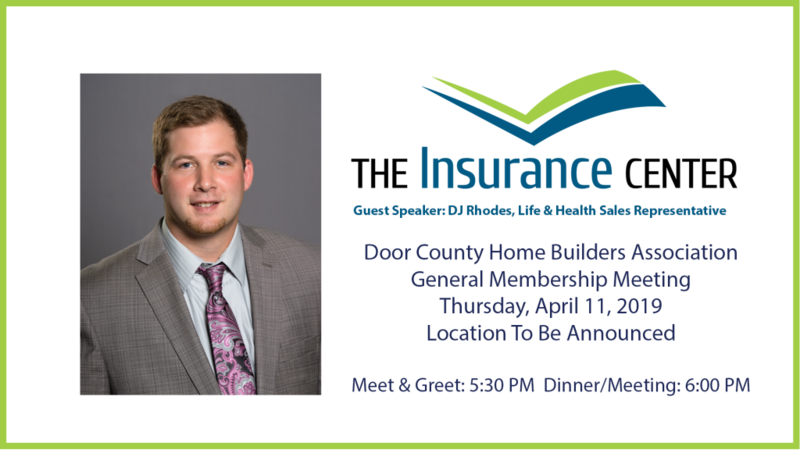 DJ Rhodes from The Insurance Center in Green Bay will be our guest speaker for the April 11, 2019 General Membership meeting.DJ will be discussing the new WBA Association Health Plan in conjunction with The Insurance Center of Wisconsin and underwritten by WPS Health Insurance, exclusive to WBA members. Click here to RSVP by Tuesday, April 9, 2019. General Membership Meetings are held on the second Thursday for the months of February, April, June, September, and November. The Wisconsin Builders Association holds four Member Meeting Days annually. Advocacy and membership topics are covered in the morning that all WBA members are welcome to attend, and–after a complimentary lunch–the Board of Directors meet (guests can accompany other BOD members). Registrations in open! Click here register for the June 26, 2019, WBA Member Meeting Day. IF you want to attend and are interested in carpooling, let us know! Registration and housing for the 2019 Spring Leadership Meeting will open on March 25. The meeting will take place in Washington, D.C. at the Marriott Wardman Park from Tuesday, June 4 through Saturday, June 8. NAHB leaders will gather for updates on legislative and regulatory initiatives and listen to an expanded economic forecast for the construction industry. In addition to the Board, Committee and Council meetings, NAHB members will meet with their congressional delegations on Capitol Hill during the all-day Legislative Conference on June 5.